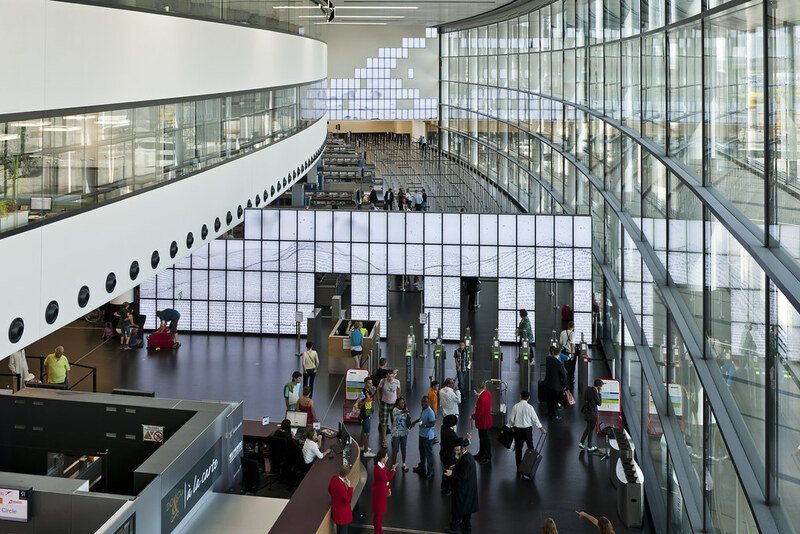 ZeitRaum is a set of large scale display wall visualizations commissioned by the Vienna Airport from the Ars Electronica Futurelab for it's Austrian Star Alliance terminal (formerly Skylink) which opened in 2012. I was part of the Futurelab team which designed & implemented the software. an imaginary space, one at the interface of all the world’s airports. Passengers enter it when they pass through a security checkpoint prior to takeoff, and leave it after touching down at their final destination. This space’s boundaries are constantly shifting in accordance with current air traffic. Within its confines, cultures, languages and nations segue into one another like adjacent time zones. This space hosts more than five billion people a year, men and women who are total strangers and yet feel that they’re temporarily interconnected as fellow members of a transient community. This space has had no name until now. The Ars Electronica Futurelab calls it ZeitRaum. Over the course of a year between 2008-2009, I developed Catch A Plane, an interactive children's game and it's distributed graphics backend which was used for the smaller (6x2 & 6x3) display walls. ZeitRaum was installed in 2012. Players in Catch A Plane use their silhouettes to interact with various flying characters which either escape (airplanes, birds, helicopters, etc) or cartoonishly fall to the ground and bounce (frog, donkey, submarine, whale, etc). The interactions only occur when the player is moving. In addition to the software, I created the interaction & sound design and provided the voices for all of the characters. All generative sounds and samples are played in a custom sound server running in Pure Data.